From the driver&apos;s seat of my rental car, Wrightsville Beach, North Carolina, glimmered like the Emerald City as I neared the drawbridge that connects the barrier island with the mainland. With its well-manicured, cedar-shingle homes and gorgeous beach, the island is indeed a jewel, but as I reached the bridge’s apex, I realized the radiance was the sun&apos;s reflection off tuna towers and outriggers belonging to a battalion of battlewagons at a nearby marina. 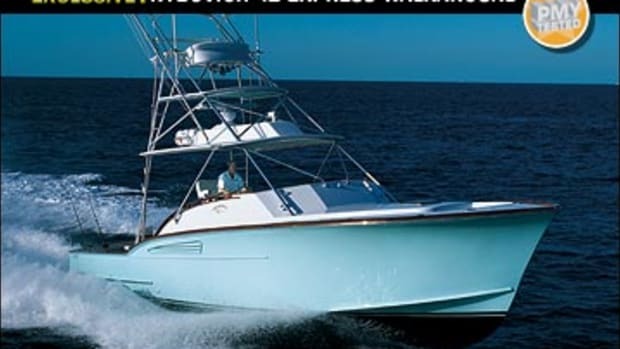 Among that legion sat the Rampage 41 Express, her hull Awlgripped in a handsome ice-blue hue. 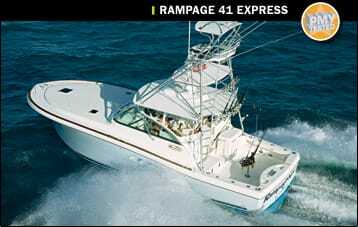 Built at KCS International&apos;s 344,000-square-foot facility in Navassa several miles up the Cape Fear River from here (Rampage is a division of KCS, which also owns Cruisers Yachts), the 41 is the builder’s largest express to date. For some time owners of Rampages from 30 to 38 feet had been asking for a larger express, says brand manager Pete Gillon, and were happy to offer suggestions for cockpit and bridge-deck layouts as well as what features on their Rampages that they&apos;d like to keep and which they&apos;d deep-six. Combining all of that with input from Rampage&apos;s dealers, the designers and engineers set to work. I&apos;d say the owners got their wishes. 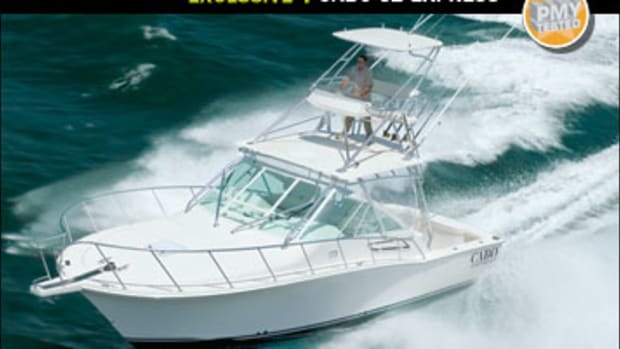 For instance, the 100-square-foot cockpit is wholly dedicated to pelagic pursuits and includes a number of sweet standards such as two 85-gallon in-sole fishboxes, a combination aft-facing seat-Frigid-Rigid ice box to port, eight flush-mounted rod holders, and a 63-gallon transom livewell/killbox. 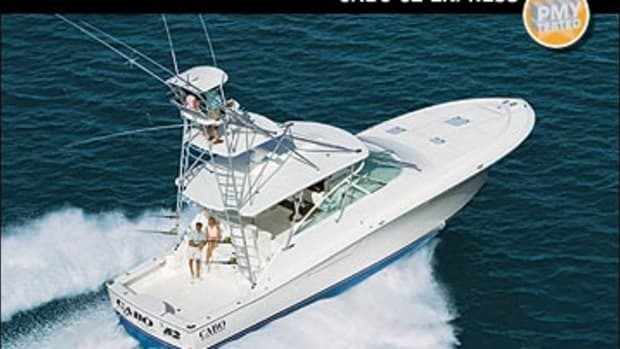 In the way of optional equipment, our boat offered a starboard bait-prep station with five drawers for tackle and a sink ($4,333), a feature that so many buyers will choose to have onboard, it probably should be standard. 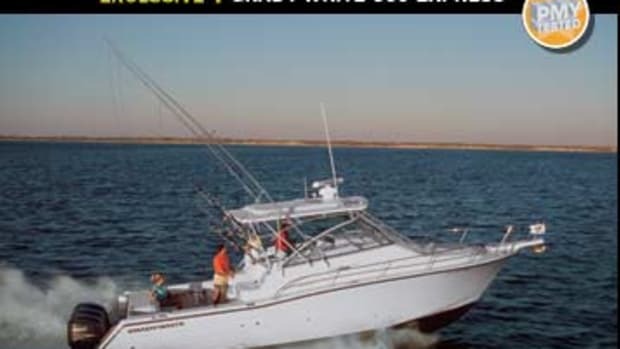 She also sported optional Lee double-spreader out- and center ‘riggers, tuna tubes flanking the transom livewell, outlets for electric reels, inwale padding, TGM Marine teaser reels, a Release Marine leaning post with four rod holders, and a tuna tower with an 18-rod rocket launcher. 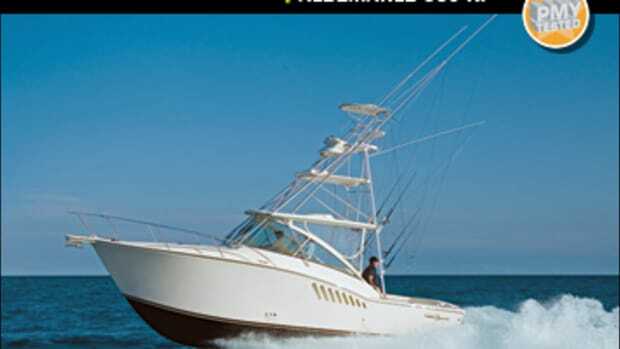 But those owners and dealers didn&apos;t just request fishing gear; comfort was a concern, too. Fortunately, the bridge deck answers those concerns. 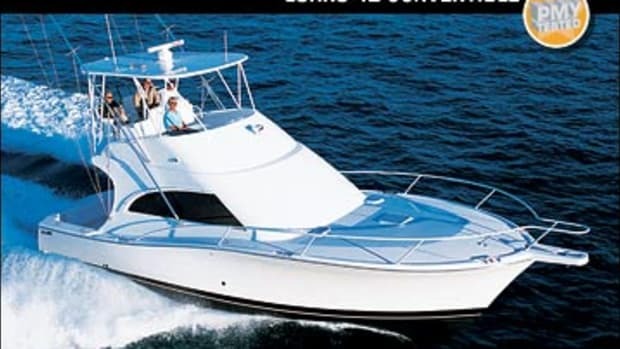 The helm headroom is an NBA-friendly 7&apos;0", and the area can be cooled by optional 16,000-Btu Cruisair air conditioning. Other comforts include an optional pair of handsome Pompanette teak ladderback companion chairs and a Release Marine helm seat that’s as adjustable as anything found in a luxury car. 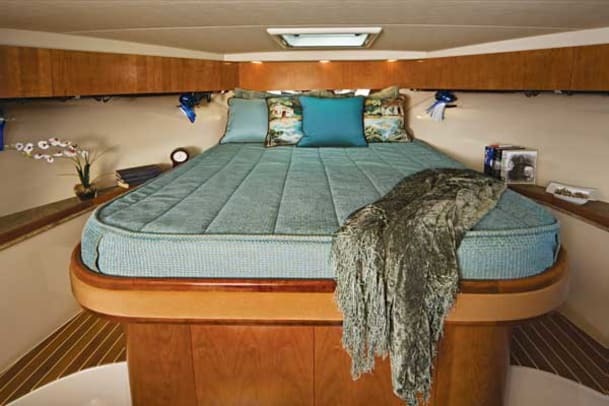 A trip below decks via the centerline companionway offers anglers a six-seat, L-shape settee and standard 26-inch Sole LCD TV and Panasonic DVD/CD home-theater system that includes six speakers and a subwoofer under the settee. Because of her optional tuna tower, I wondered if she&apos;d heel excessively in hard turns. She didn&apos;t. Earlier Gillon had pointed out that her 600- and 100-gallon fuel tanks are on centerline—the former under the cockpit, the latter between and under the powerplants—which he says helps ensure transverse stability. In addition, a favorable longitudinal center of gravity is achieved by installing her powerplants deep and far forward in the hull. Shaft angles on other Rampage models average around 17 degrees, while by comparison the 41&apos;s angle is 10 degrees. Later, when I was able to crunch the test numbers and do some research, I discovered that the 41’s 700-gallon fuel capacity is impressive in two ways. 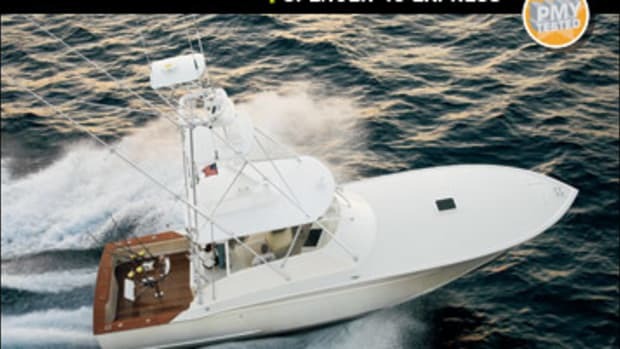 The first is that it’s unmatched among production express boats in her size range with comparable dry weights and total horsepower; its closest competitor falls 100 gallons short. The second is the range it produces: Full of fuel, the 41 can make 421 miles at 33.3 mph and 2000 rpm, 80-percent engine load. Back off to 27.3 mph and 1750 rpm, and you’ll get 470 miles. As I helmed the 41 back inside the inlet, I spotted a few surfers—they regularly paddle across Masonboro Inlet to ride the waves that peel off the inlet’s southern jetty and onto uninhabited Masonboro Island. 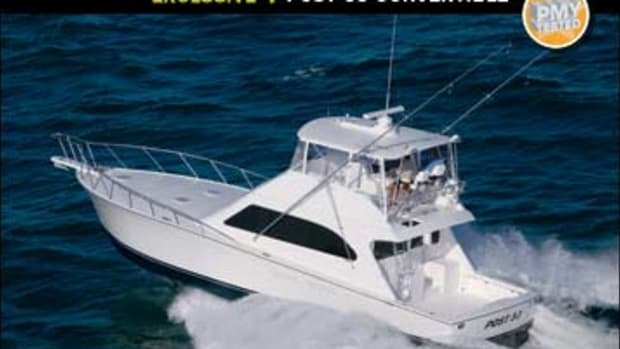 After realizing that the 41&apos;s excellent sightlines had helped me spot them, I concluded that this boat is truly ready to go hunting. 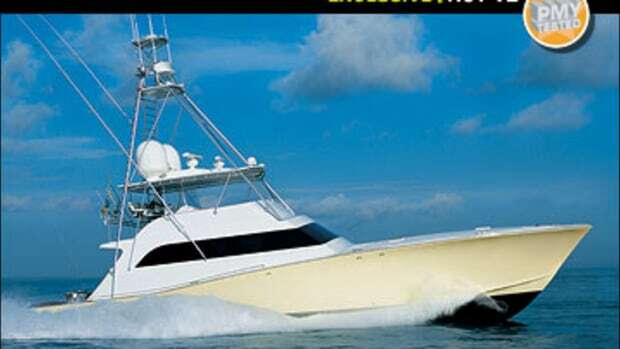 All she needs is fuel and bait.